Thanks to Pattybelle we have 3 prizes = 3 winners! 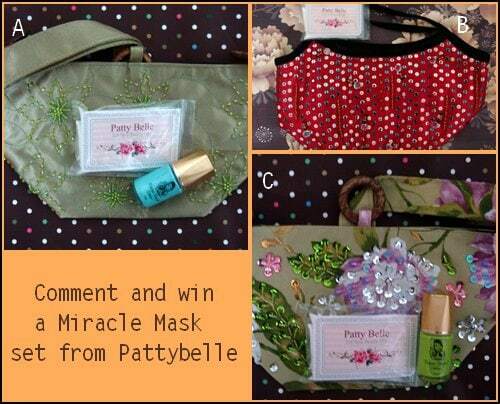 Pattybelle has packaged the mask with a bag as a giftset so you really get more than just a mask. Hop along to find out how to win yourself something nice! Winners will be picked by the sponsor and prizes will be sent by the sponsor. Winners will be announced on this post and will be contacted by email. Open to anyone with a mailing address in Malaysia only. Please read the terms and conditions of contests. Winners as selected by the sponsor are Yuki, Kittycat and Suzanne. They have been contacted by email. NEXT POST: Dior Capture Totale One Essential Serum – One Serum to rule them all! I’ve to admit that I do brisk walks every morning to the station and also I try to run for 15 minutes during lunch. ooo… I need to try a good mask pronto! 6) If u like cheese, eat swiss cheese as it promotes the secretion of some hormone or enzyme (can’t remember) to decrease the storage of fat in your body! I’ve been on diet for 3 months. Something I’ve never done my entire life. The best way is low carbo intake. U can eat carbo, just reduce the amount & if possible no carbo for dinner. And if u happen to have eaten a lot, make sure immediately go for diet the next day. Don’t wait! The longer u wait, it’ll much difficult to lose those kilos. So far, I maintain my weight with this kind of diet routine. My tip? Stress! Hahahaha… 😛 Seriously, I lose most of my weight when I’m stressed. 1) exercise, exercise , exercise! my favourite is spinning class, good for the knee too….as my family has history of knee arthritis. 3) Replace meal with fruits and vege….green apple and oat drink for bfast gives you flat stomach…..
5) Stay happy…keep the energy up and hv a positive mind….keep life going…..
Get enough sleep. And if possible, sleep early. People who don’t get enough sleep gains weight faster than those who do get enough sleep. I have been going through the losing weight phase for some time and I have tried a lot of ways to lose weight from cutting down my food intake to not eating rice. However, the best way to lose weight is always eat more meals with small portions. When you eat regularly, your metabolism rate will not slow down and this helps in fat burning. Plus, you will not feel hungry with constant eating of small portion of meals which will help to not to overeat at main meal times(eg: dinner). My face would love a miracle mask! Well when I was studying in UKM, I followed a rather simple diet & exercise that guaranteed weight loss in a month! 1) Eat rice only ONCE a day (preferably in the afternoon). Only 1 scoop and make sure you pat the spoon against the side on the rice cooker so you only get one smooth scoop of rice. 2) I substituted my love for fried chicken with Fish. Steamed is the best. 3) I made sure I had my dinner (which usually comprises of noodles) before 7pm. 4) Stay away from soft drinks COMPLETELY. Drink lots of water and fruit juice. 5) In between meal times when your tummy growls, it doesn’t mean you are hungry, it just needs hydration so drink water instead of reaching for a snack. 6) Sleep at the same time every night. It’s healthy to get an average of 7-8hours of sleep a night. 8) It’s proven and it works, when you are happy you lose weight because you do not overeat to compensate. =) So stay happy! 1) Execise daily (try to or the least 4 times a week) for 1hour that includes Strider Machine + Lunges + Squat. 2) My ever-trusted portable Sauna! 3 times a week at most. 4) Don’t skip breakfast, you will eat more for lunch and it is not healthy. I always share lunch with my boy so the slower of the eating rate, it makes me feels full faster. 5 Would you believe me that my ongoing breastfeeding my little tot also helps me reduce my weight? It is true! Eat smaller meals. Don’t stuff yourself with too much fibre as this can actually make you feel bloated which messes with your mind – making you think you’ve put on weight so you try to restrict your eating further which may screw up your metabolism in the end. Its a vicious cycle. Eat in moderation is the key! stick to three average size meals a day! and no snacking in between. seriously, it works. Ahh… By erm….exercising in a form of something you love? I go for Taekwondo lessons and they’re fun! Keep a food diary, and make sure you show it to someone who you respect and eats healthily. Most of us either overeat or snack nonstop. By making sure you write EVERYTHING that goes into your mouth (excluding lipstick or lipgloss of course, unless you can think of a way to measure it! :D) and the amount that you eat, you’ll be more aware of what and how much you eat. Also, by recording the times as well, you’ll know when in the day does your hunger pangs usually hit, and so you can make sure you have a healthy snack ready (Celery’s a negative calory food btw, where you use more energy eating it than it offers). Showing it to someone else will expose you to self-shame/guilt and you’ll be EVEN more aware of what and how much you eat. To lose weight, consume a bowl of oats first thing in the morning everyday! People sometimes confuse thirst with hunger. Sometimes after dinner I still feel hungry but all I needed was to drink a glass of water to feel full. And if you don’t like plain water, you can always add a slice of lemon or orange. P.s. Oh, I found this online too: 9 powerful reasons to drink water. In my opinion, miracle comes in the form of hard work and determination. Every woman wishes for a miracle in order to lose her weight. I am the best epitome of a miraculous survivor of a healthy diet which I thought was impossible to achieve. I was once 60 kilogram. Now, I am just 51 kilogram; with smoking hot curves!!! Gear up to know my miracle? Although it took a lot of effort and willpower, I have successfully changed my eating routine. Instead of the usual “roti canai”, I have fruits for breaksfast especially apple and banana. The fruits are not only nutritious but they are very fulfilling too. I eat about two apples or three bananas every morning. Then, lunch time rings its bell. I would usually have either “mee soup” or two slices of toasted breads with eggs. The meal would provide carbohydrate and protein; giving me enough energy to work for the rest of the evening. Lastly, I would take grapes for dinner. I would usually finish a small bunch of grapes while watching the news. The grapes provide vitamins and minerals that would help to rejuvenate my skin and energy. Hence, I would be refresh to start my day tomorrow. Honestly, I have been following the diet for nearly two years. Initially, it was difficult. As time goes by, I could cope up with the diet and see the improvement in my apperance. I also feel more confidence and younger-looking!! oh.. my tips is always drink a glass of warm water before you eat anything. It will let you feel full faster so you won’t eat a lot, plus, water is good for your body and skin!!! 1. I don’t diet since I love food (I was breastfeeding anyway). Just took my usual breakfast, lunch and dinner with a tea thrown in. No supper other than a mug of Milo or low-fat UHT milk. 3. Drink lots of water – breastfeeding required it so that was easy but working in air-cond rooms dry out your skin anyway. 4. Eat more fruit. I’m terrible at this because I’m super lazy so Hubby gets me the easiest fruits to eat e.g. green/red apples, guava, pears, grapes. 5. NO snacking. I’m not a snacker (I’m a craver!) so this is easy for me but I know a lot of people who do and their desk drawers are filled with cookies, chips, nuts, sweets, preserved fruits, “energy bars” which are ALL high in simple carbs, fats, salt, preservatives and CALORIES. I hope this helps and I hope I WIN!! !